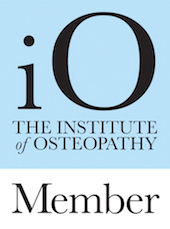 This is a new website that offers support and advice to those suffering from long-term back pain with a focus on changing attitudes, becoming empowered and ultimately getting on top of the situation. There are a team of experts (including me) on hand to offer our opinions and a little advice to help sufferers take back control. I’ll be speaking about how important it is to treat each case individually and will be presenting alongside a trusted local personal trainer and a hip specialist. The founder of the website, Arman Brevig will also be introducing the website and explaining where the idea came from. It’s a FREE EVENT and should be a lot of fun. Why not register and come along? 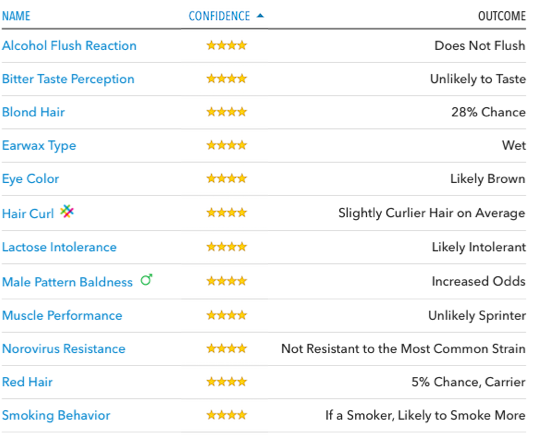 About 6 weeks after sending off my home testing kit (as seen in Part One) I received an email from 23andMe telling me that the results were in. It’s all available through the website, which lets you browse through as much or as little of the information as you wish. Some of the information is pretty frivolous but other parts are really quite important so one must tread a little carefully through all the data on display. The results are divided into two main areas: Health and Ancestry. 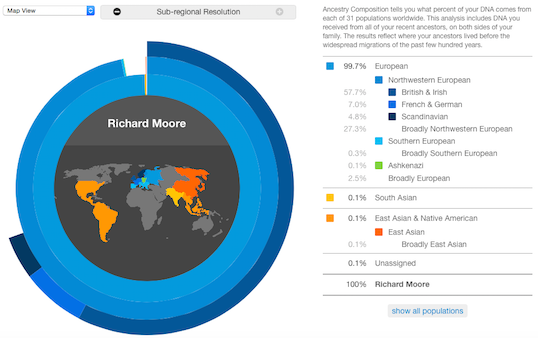 Unsurprisingly, I’m 99.7% European but only 57.7% is classed as “British & Irish”, which is less than I expected. It does confirm that I have some Scandinavian DNA (4.8%) which maybe goes some way to explaining my interest in minimalist furniture and cold weather! Maybe 😉 The 0.1% “unassigned” DNA is intriguing… alien? 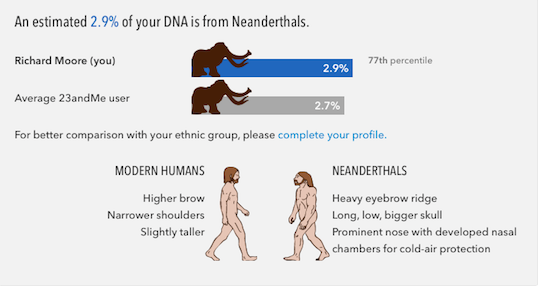 The website also looks at how much of your DNA is closely related to Neanderthal DNA. The average is 2.7% and mine is… 2.9%. Yeah, thanks for that guys! This is probably the more interesting section, with the potential to impact on our day-to-day lives. It’s also the main reason why I wanted to do the test in the first place. These reports show your results for specific genetic variants that are associated with a higher risk for developing certain health conditions. They don’t tell you whether you definitely will, or will not, develop the condition but rather, whether the risk is there. Of course there are other genetic variants linked to these conditions that are not covered by these reports and environmental and lifestyle factors can also contribute to these conditions. However, there are also a handful of ‘locked reports’ which are probably more interesting/important for the average joe (like me). Some folks would rather not know, so you need to actively click on the reports to see your results, which is a nice feature. OK, so this is interesting. This section looks at the way that I do/can/could respond to some common and not-so-common medications. So I have a ‘rapid’ response to PPI meds (for acid reflux, indigestion etc) which is interesting, although they’re not necessarily a medication that I particularly use, but have done in the past. In fairness, they did seem to work! 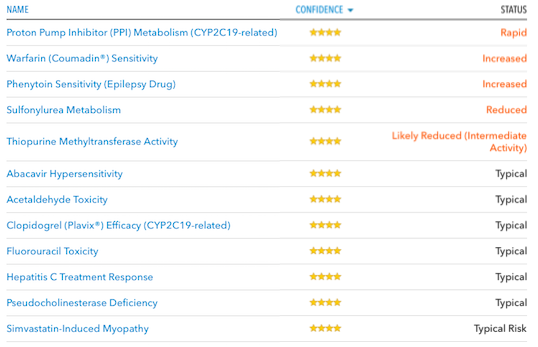 It’s worth noting that you can click on each of those results to find out more about what the medications are for and what the results mean. These reports show your results for specific genetic variants that can cause certain health conditions. Many of these conditions are recessive, meaning that they only occur when you have two variants for that condition, one inherited from each parent. If you have inherited just one variant, you are said to be a “carrier”. Carriers usually do not have the condition, but can pass the variant on to their children. These reports cover only a subset of possible variants that may be linked to a condition, it’s therefore possible to have other variants not covered by these reports. All kinds of stuff in here, 50 + conditions, but I’m ‘absent’ of all of them, so nothing to see here…. A real mixed bag this section. ALL kinds of information on display from the frivolous (ear wax type?!) to the interesting (lactose tolerance – I’m likely intolerant apparently but I wouldn’t say that I have any issues) to the inaccurate (eye colour = “likely brown”, erm, mine are green) to the more important (response to diet, exercise, pain etc). From this I think it suggests that a high fat diet probably isn’t for me as I don’t carry the gene variants that benefit from high fat diets. This is really interesting to me as I’ve always thought that carbohydrates were my nemesis? Maybe not? I’ll need to experiment to find out more. To be honest, I’ve been a bit blown away by the sheer volume of information on offer here and there’s plenty more reading to do to really get to the bottom of my personal data. What do you think? Going to get your DNA tested? To book an appointment over Christmas, give us a call on 0115 981 5134 or send an email to info@mooreosteopathy.co.uk and we’ll do our best to find someone that can see you. Did you know that osteopaths can help treat lower back, joint and muscle pain during pregnancy? Experiencing some degree of pain during pregnancy is completely normal and to be expected, however some women suffer more than others. Don’t worry, osteopathy can often help! The pain may be most noticeable when walking, climbing stairs, getting out of a car, standing on one leg or turning over in bed. We’ll start with a detailed case history, looking at the pregnancy so far and any issues that you may have had in the past. Then we’ll look at your overall posture, your lower back and your pelvis to see where the pain might be coming from. Treatment often involves soft tissue massage, loosening restricted joints and creating good posture, balance and stability throughout the lower back and pelvis. You’ll also be given some exercises to do at home to strengthen the muscles supporting the joints of the back and pelvis and to maintain good alignment. Hannah Williams is our osteopath who specialises in treating ladies during pregnancy. If you’d like to come in for an assessment and treatment with her or one of the team at our clinic in West Bridgford in Nottingham, give us a call on 0115 981 5134 or email us at info@mooreosteopathy.co.uk. It’s now possible to buy a simple kit online to have your own DNA tested to investigate not only your ancestry and genetic traits but also your inherited risk factors for many common illnesses. It’s early days, but this information could be the key to all kinds of future technology. To find out exactly how it all works, I’ve decided to turn guinea pig! The first step is to get the raw data from 23andme. Once the results come through I’ll talk about what’s comes in and what it all means And where we go from there! We’re really excited to announce that we can now offer Nutritional Therapy & Advice at the clinic with Roger Smith, BSc (Hons). He’s now available on Thursdays, offering one hour one-to-one consultations for a number of health issues. 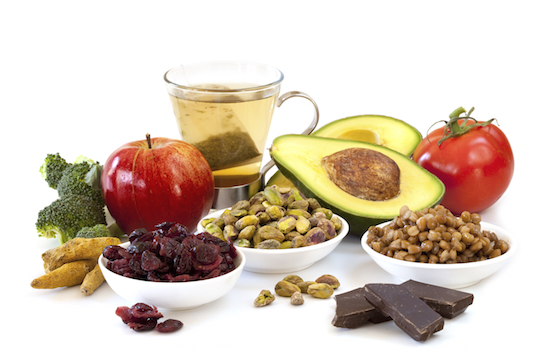 Roger Smith is a food chemist providing a unique service that allows you to understand your current deficiencies and excesses of essential nutrients. From here he is able to guide you in finding your ideal foods and drinks for better gut health and eliminating allergies. He has helped clients recover from diabetes, chronic fatigue, low thyroid, high ‘bad cholesterol’ and dangerously high triglycerides, depression, bipolar disorder and of course IBS (Irritable Bowel Syndrome). If you think that Roger could help you, or would like to find out more about his service, why not drop him an email on rogersmith@mooreosteopathy.co.uk. We’re very excited to announce that Mark from HipTrac UK is going to be doing an Open Day at our clinic on Saturday 31st October to demonstrate his revolutionary hip traction machine. Designed to help people suffering from osteoarthritis of the hip who are unable, unwilling or unsuitable for surgery, it provides gentle traction to the hip joint to increase joint space, reduce muscle tension and improve mobility of the joint. Mark will be here from 10am to 3pm on the day offering hip assessments and free demonstrations of the device for anyone who drops in. Alternatively you can give him a call on 0115 882 0733 to book a slot. After Mo Farah won gold at the Great North Run last weekend, we hope many of you have been inspired to dust off your running shoes and take to the streets. However, start off too enthusiastically and you could find yourself feeling pain on the outside of the knee, which can often be attributed to a condition known as iliotibial band syndrome (or ITB syndrome). The ITB is a strong band of connective tissue extending from the muscles of the hip down the outside of the leg to the knee, where it helps to give stability. When performing very repetitive movements like running or cycling, the ITB can become tight, irritated and inflamed, leading to outer knee pain just above the joint line. Unfortunately ladies, you are more likely to experience this due to having a wider pelvis, which affects the angles the hips are held and leads to more strain put through the outer leg. If you believe ITB syndrome is slowing you down, there are some steps you can take to reduce the pain initially. Take some time off running, or at least reduce the miles you are doing. Substitute running with swimming or aqua jogging for a couple of weeks. Ensure you are wearing shoes that provide sufficient support for your feet. Always perform a good warm up before running and make sure your hips are mobilized. As with all conditions, the most important thing is get an accurate diagnosis and treatment plan. 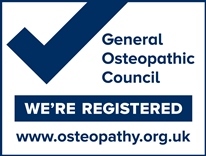 So we always recommend booking an appointment with one of our osteopaths to provide a full assessment and come up with a tailored stretching and strengthening plan alongside our expert hands-on care. Give us a call on 0115 981 5134 to book an appointment or use our online booking system.